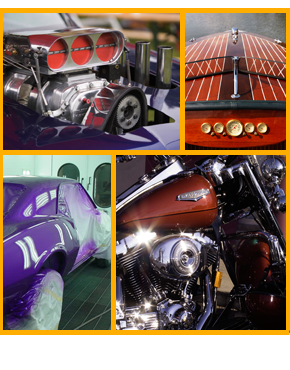 Hot Rods- we can completely restore your hot rod or vintage vehicle, repair any damages including spot work to match original paint. Custom Paint - We can custom paint just about anything you want from something as small as a helmet to as big as a boat, car, truck bike etc... See the gallery for what we can and have done. Auto Body - Complete auto body and paint on all makes & model of cars, trucks, SUVs, imports and domestics. Water Craft - We repair all different types of watercraft, fiberglass, metal, aluminum. We can also give it a custom look with some custom paint work.